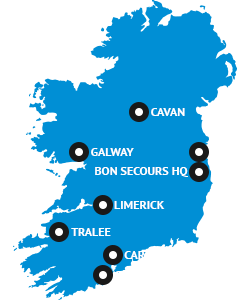 Bon Secours Health System Cork is Ireland’s largest private hospital, and it is also one of the largest private hospitals in Europe. Our hospital was established in 1915 and has more than 300 beds. We employ more than 1,000 staff and admit about 35,000 patients every year. It is a general hospital providing an extensive range of medical and surgical specialties for adults and children. A broad range of health and social care professionals. ESMO (the European Society for Medical Oncology accreditation).